This isn't a pre-released "leak," this is the first legitimate packaging of Minecraft's Adventure Update. 1.8 is now, officially, live. Open your Minecraft client, and get it going. What can you expect to see? Well, for starters, check out the trailer above as it details some of the happenings in your newly upgraded world. If you'd like to see an even more detailed rundown of what's in this new batch of content, check out our own Sean Aune's bullet points for the PAX demo. There are still some bugs. The Mojang team leaked out a buggy version of the beta last Friday, to those willing enough to install it (read: "everyone"), and they've since been awash with strange problems and fixes. Most of them, however, have been adressed. This is a beta, just remember that when you play. If you're on TechnoBuffalo's Minecraft server, know that we're going to get this running soon. Once Sean gets up this morning, I'll be pestering him by way of phone, email, messaging and screaming. That's probably when he'll tell me to calm down and get back to work. 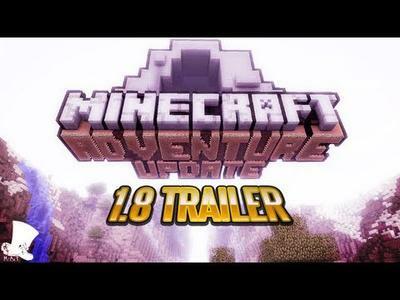 What do you folks think of Minecraft 1.8?